The cocoa trade from Côte d’Ivoire, the country’s main commodity has played a major role in the four-and-a-half-years of armed conflict. Over US $118 million revenues from the cocoa trade flowed into the conflict by funding both the government and the rebel group ‘Forces Nouvelles (FN)’ in the North of the country (Global Witness 2007). Last year, the UN expert panel on Côte d’Ivoire reported that diamonds were still being smuggled out of the country via Mali and Ghana in violation of the United Nations embargo. By this diamond trade the rebels would generate estimated revenues of US $9 million to US $23 million to finance their movement (United Nations Security Council 2006). 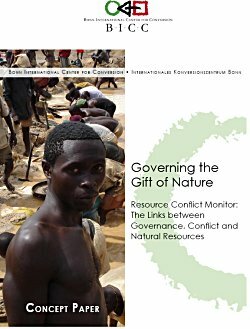 Côte d’Ivoire is only one of the countries that unfortunately illustrate the presumed nexus between natural resources and conflict. Numerous other countries (to name a few: Cambodia, Angola, Sierra Leone and Sudan) have been a stage for plunder, fights, corruption and mismanagement related to natural wealth in those countries. The Democratic Republic of Congo is one of the world’s richest countries in terms of natural wealth. The country received the ironic description ‘geological scandal’ because from as early as the time of the Belgian King Leopold II, the country has been plundered by national and international elites, rebel groups and companies. The illegal smuggling of diamonds out of the DRC in 2000 exceeded the total national state budget. Also nowadays, corruption scandals and mismanagement of the country’s natural wealth make it less likely that these stocks truly contribute to development and post-conflict reconstruction.